Using HEPR solutions satisfies regulatory compliance, sustainability initiatives and performance demands. There are currently thousands of new environmental regulations awaiting attention from legislators and regulators around the globe. Different standards hamper growth and thus, pressure to harmonize regulations is likely to continue alongside the regional and global integration of markets. The marine industry is one of the most heavily regulated industries and was among the first to adopt widely implemented international safety and environmental standards. It is principally regulated by the International Maritime Organization (IMO), which is responsible for the protection of the marine environment and has, over many years, adopted a wide range of measures to prevent and control pollution caused by ships. One of the main goals of IMO is to mitigate the effects of any damage that may occur as a result of maritime operations and accidental spills, leaks and discharges. So far, IMO has adopted 51 treaty instruments for the regulation of international shipping, 21 of which are directly environment-related. Separately and to address the increasing concern regarding the extent of spills, leaks and discharges of chemicals into the oceans, the U.S. Environmental Protection Agency (EPA) has developed the 2013 Vessel General Permit (VGP). Oil-based chemicals that routinely leak into the sea during normal operations include fuel oils, gear oils, hydraulic oils, marine lubricants, greases and cleaning oils. They can reach concentrated levels with serious local impacts on water quality, impacting fisheries, wildlife and recreational boating. Under the 2013 VGP, all ships larger than 79 feet must use Environmentally Acceptable Lubricants (EALs) in oil-to-sea interfaces when in the three Nautical Mile limit and in the Great Lakes unless technically infeasible. Similar EAL regulations are coming into effect for smaller vessels. The EPA’s Small Vessel General Permit (sVGP), which is currently pending and expected to go into effect in December 2017, will apply to non-military, commercial vessels that are less than 79 feet in length. According to the “Economic and Benefits Analysis of the Proposed sVGP” document issued by EPA, compliance with the VGP and sVGP allows vessels to meet the Clean Water Act (CWA) requirement to obtain National Pollutant Discharge Elimination System (NPDES) permit coverage for discharges incidental to normal operations. The discharges covered in the sVGP are categorized into several broad categories, which are listed in the permit, and include: common-sense requirements for general discharges, fuel management, engine and oil control, solid and liquid waste management, deck washdown and runoff and above water line hull cleaning, vessel hull maintenance, graywater, fish hold effluent, ballast water, and overboard cooling water discharges. EAL use would fall under the engine and oil control category, which includes “all machinery and equipment, including but not limited to stern tubes, wires, and two-stroke engines, where discharges of oil to surrounding waters are likely to occur” (as defined in Part 6 of this permit). With the VGP, drafted sVGP and other global sustainability initiatives firmly in place to regulate discharges by EPA, IMO and other organizations, two main EAL solutions have emerged for marine applications – Hydraulic Environmental Synthetic Esters (HEES) and Hydraulic Environmental Polyalphaolefin and related hydrocarbons (HEPR). While both options are globally available and meet current environmental regulations, the HEPR technology has inherent advantages that drive economic value and enable environmental leadership. While HEES products can deliver high performance, they can be prone to hydrolysis in the presence of water. That is, HEES components can decompose to form acids and alcohols which impact lubricity and can cause potential damage to metals and seals. In contrast, HEPR solutions have excellent thermal and hydrolytic stability and broad temperature range performance. For example, RSC Bio Solutions’ latest HEPR solutions pair enhanced renewability with an excellent performance profile to meet the growing global regulations and evolving market needs. The RSC FUTERRA HF series is a new Ecolabel-certified (a voluntary label promoting trusted environmental excellence) renewable hydrocarbon EAL. According to the European Commission, the EU Ecolabel helps to identify products and services that have a reduced environmental impact throughout their life cycle, from the extraction of raw material through to production, use and disposal. FUTERRA outperforms other EALs in several key areas, such as durability, water separability, oxidative stability, hydrolytic stability and seal compatibility. 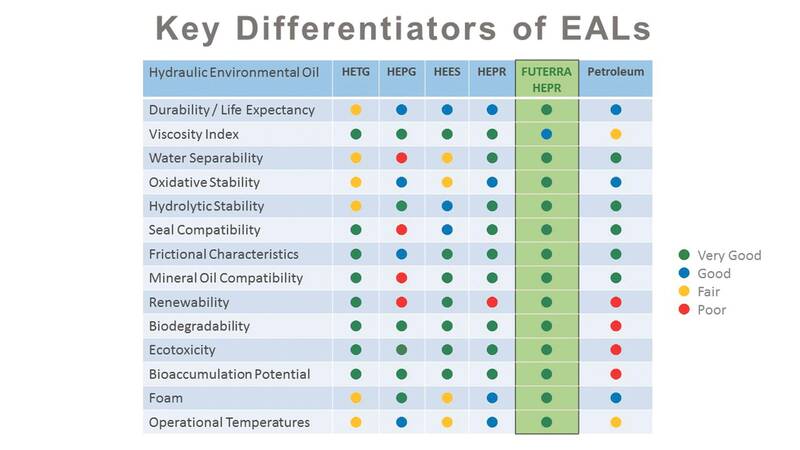 It allows for easy conversion and, while some EALs are incompatible with certain types of seals, FUTERRA has very broad seal compatibility, even with traditional seals like NBR, allowing operators to use the seal that is the best choice for their specific needs. 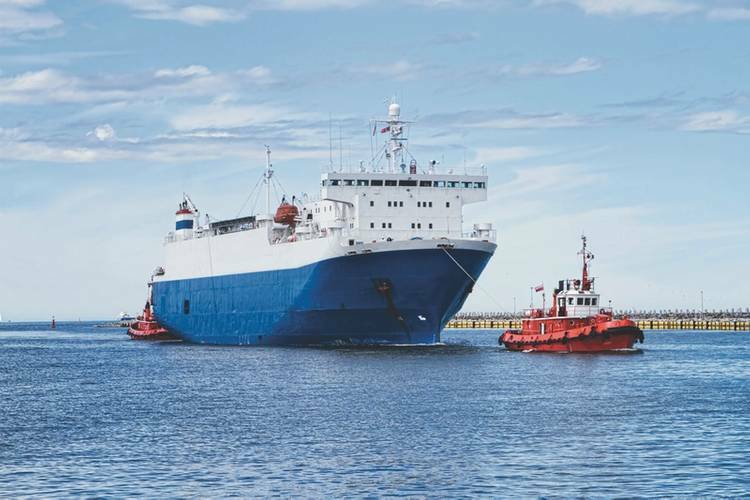 Indeed, maritime professionals are looking for subject matter experts to help them navigate an increasingly confusing landscape – in terms of both reducing environmental and employee risk and increasing their company’s bottom line. If you follow expert advice and equip your crew with VGP and sVGP compliant fluids and instructions on how to use them, you can focus on both sustainability and performance and prepare your company for success. Lauren Lionberger is the global commercial director, marine for RSC Bio Solutions. She previously served with Chevron and brings extensive experience in the oil and gas and lubricants industries. She has a bachelor of science degree from Baylor University.